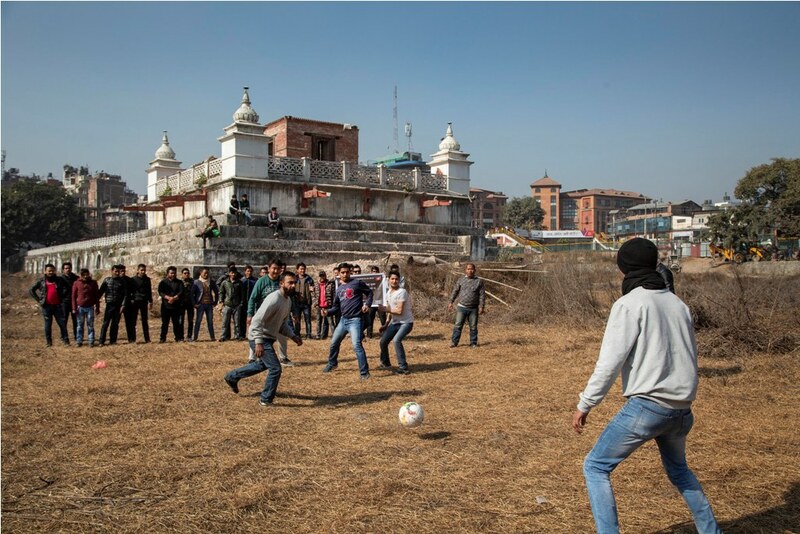 The protesting students played football on the southeast side of Balgopaleshwor temple that was badly ruined by the 2015 earthquake. The students said they staged the symbolic protest to remind Prime Minister KP Sharma Oli of how he has been failing to fulfil his commitment, and boasting of false development works instead. “We played football here today so that our PM will proudly say we have turned Rani Pokhari into a football ground. We are pressuring government and the KMC with this symbolic protest,“ said another protester Sumit Karki, vice chairperson of NSU’s Min Bhawan Branch. The students played football for over an hour while many onlookers gathered around the railings of the historic pond covered by weeds. Around a dozen of police personnel were also deployed in the area but police didn't take any action against the protesters. 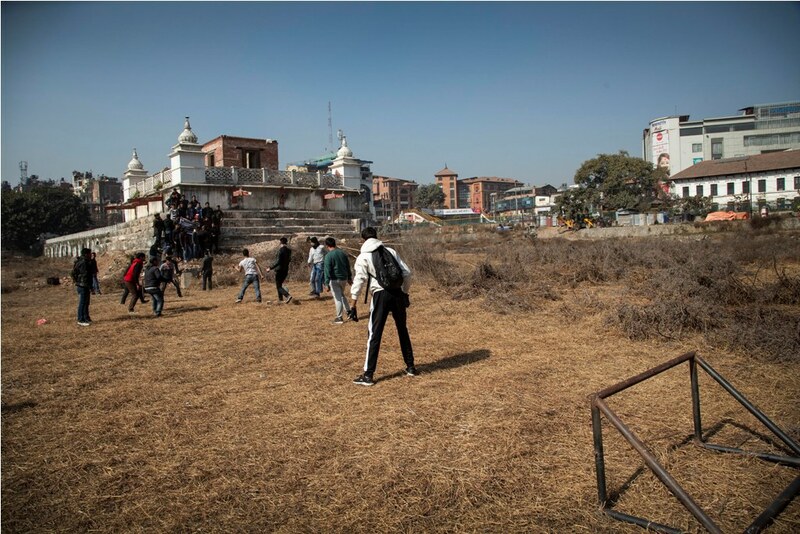 "We played football here after taking permission from Department of Archeology," said Subedi. Once a beautiful pond in the middle of the metropolis, Rani Pokhari was ravaged by the 2015 earthquake and authorities have remained indifferent in resuming the reconstruction of the monument. 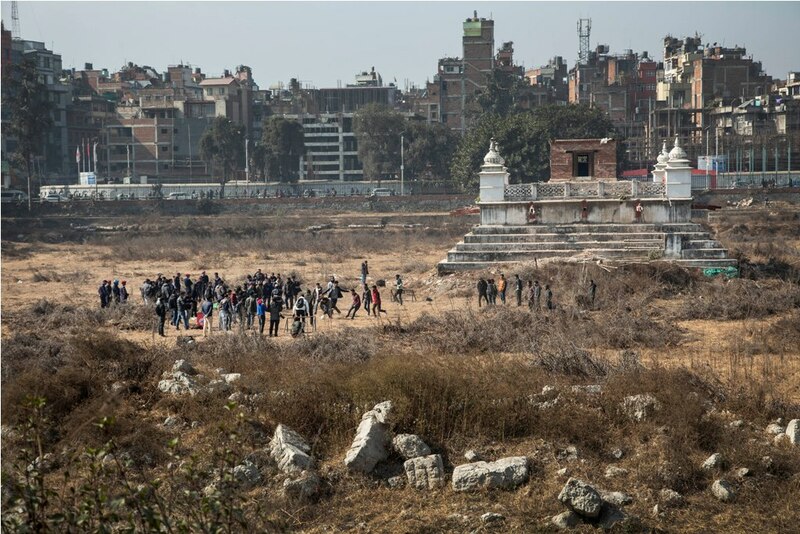 Even though the Kathmandu Metropolitan City began the reconstruction, the process has not been free of controversies. The KMC, which had initiated the construction of the pond, had built a 10-feet high concrete retaining wall on the eastern side of the pond as a part of the reconstruction last year. After widespread criticism from various quarters in December 2017, the metropolis removed the wall for which it had spent Rs1.6 million. So far, the government has spent Rs25 million for the restoration of the historic monument. Locals and several heritage conservationists padlocked the reconstruction site as a protest against insensitive decision on part of the metropolis to use concrete to build the wall around it. The cycle of resuming and then discontinuing the reconstruction work has been going on ever since President Bidya Devi Bhandari laid the foundation stone in 2016. After a long gap, in September 2018, the KMC resumed the reconstruction of Rani Pokhari. However, progress has remained snail-paced. Rani Pokhari, or Nhu Pukhu (new pond) in Nepal Bhasa, was built in 1670 AD by King Pratap Malla in memory of his son, to appease his wife.